After a one hour flight from Busan to Jeju island we noticed right away how different Jeju is from the rest of Korea. The volcanic island is dominated by Mt. Hallasan, which is visible from nearly everywhere on the island, and the coastline is dotted with beautiful beaches and cliffs. For our first day on Jeju we decided to take a bus east of the city to visit the famous Manjanggul lava tube. We were lucky to meet a nice Korean girl named Yeonwoo, who helped us buy our bus tickets. It turns out that she had lived in Canada for a while (Regina & Montreal), which explains why she can speeak English so well! She was visiting Jeju from Suwon (an hour or so from Seoul) with her mother, and was also bound for Manjanggul. We agreed to split a cab with her from the bus stop, and ended up spending most of the day together. Very close to Manjanggul is the Gimnyeong hedge maze, so we stopped in on the way with Yeonwoo and got thoroughly lost together. The maze is very easy to underestimate, which made it quite a lot of fun. 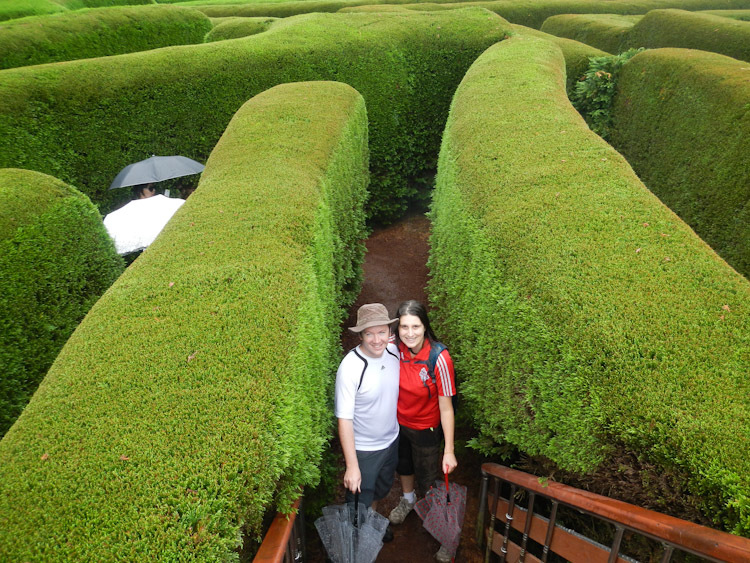 Yeonwoo snapped this great picture of us just as we reach the half way point of the maze. After the maze we walked about 500m up the road to the lava tube and headed under ground. At just under 8 kilometers long, Manjanggul is one of the longest lava tubes in the world. It is also home to the world's largest known lava column, which marks the end of the section which is open to tourists. The next section of the lava tube is home to 30,000 bats, which is why it is a protected area which is only open to a few lucky researchers. In the photo at right, Nicole looks past her preference for sedimentary geology to point out some impressive lava stalactites. Nicole in a lava tube is like a kid in a candy store. Hallasan had stared back at us since the time that we land on the island, and we agreed that the 1950m high extinct volcano must be conquered. 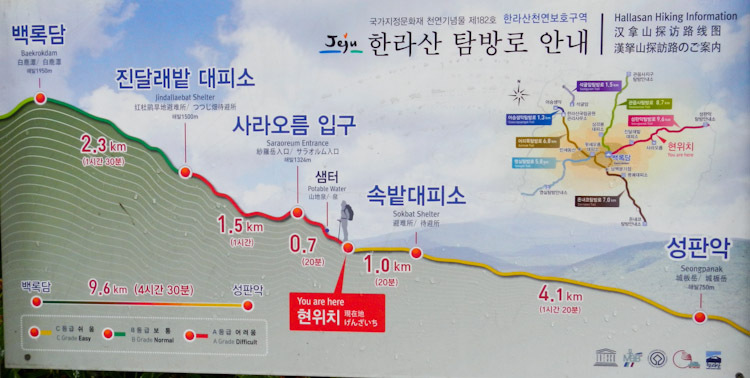 So the next day, we again grabbed a bus from the main city bus terminal and headed about 40 minutes south east to the start of the Seonpanak trail. 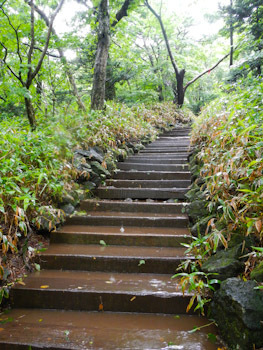 The trail is a 1200m climb to the peak, stretched over 9.6km of fairly well groomed trail. About half way up, you can get instant ramen noodles and a few other snacks from a shelter area at the ranger station. You must leave from this point to head to the summit before 1 P.M., or the rangers will not allow you to enter, so we decided to stop for noodles on the way down instead. As we neared the top, the trees disappeared and what had seemed like a light mist back in the shelter of the forest became a torrent of wind and rain. At times, the wind was so strong that we could barely stand up. 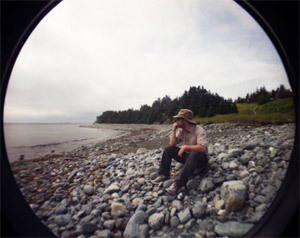 It reminded us of some of the hikes we had done in Newfoundland along the East Coast Trail, where the weather can often sneak up on you. We decided to shoot a quick video to say hi to everyone back on the rock. Unfortunately, with the bad weather, we couldn't see the crater lake that is at the top of Mt. Halla, so on the way back down, we took a short side trail up to a smaller crater lake which had formed in one of the volcano's parasitic cones. 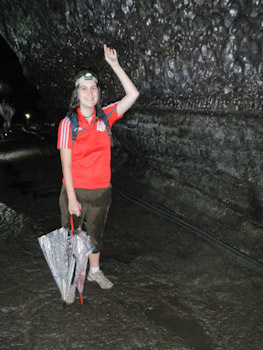 Once again, with Nicole being a massive geology geek, the increasingly soggy weather wasn't enough to dampen her spirits. With the short side trail, the round trip added up to just over 20 kilometers and took us about 7.5 hours to complete at a reasonably brisk pace. The next day we slept in a little bit, and after using hotel room's hair dryer to dry up our soggy shoes, we decided to head out to nearby Iho Beach. We found a nice little spot on the beach to sit down for a while and have a couple of beers and a delicious seafood-topped green onion pancake. 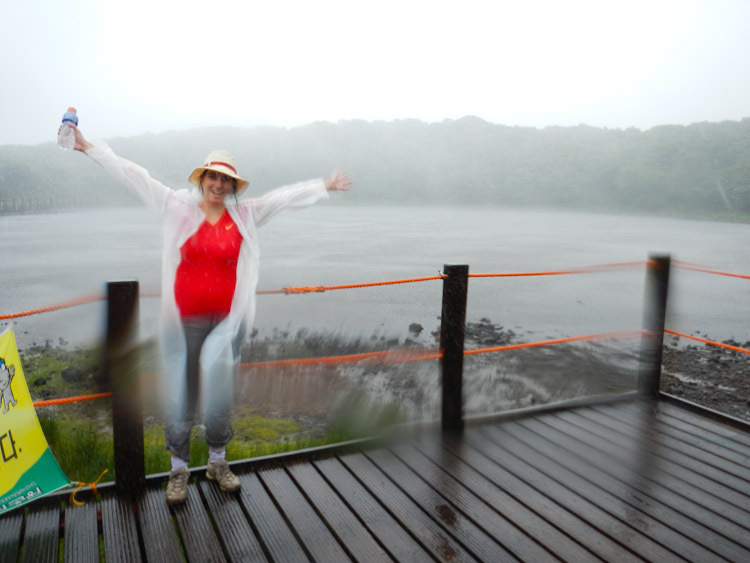 We were very happy that people had recommended visiting Jeju island to us. 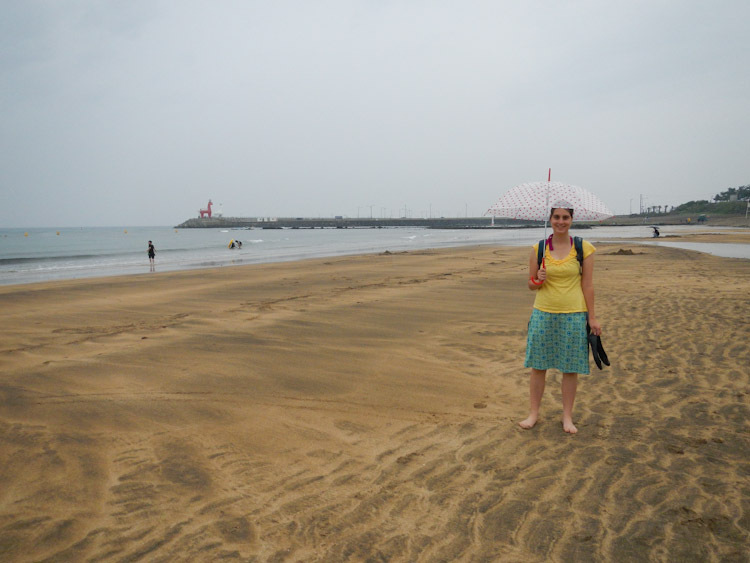 4 nights on Jeju was just not enough. We would love to go back, and maybe tackle a bike tour around the island. We would also love to head back to the top of Hallasan on a nicer day. Nicole posted some more details about our trip to Jeju on her blog here.